I’m using the cover of the Transtories anthology (Aeon Press, Dublin, 2011) as an ‘icon’ because I feel more closely involved in this project than any other anthology with which I have been involved. The editor was Colin Harvey who sadly passed away before it was actually published so it fell to me to take up the reins and bring it, administratively, over the finishing line. It makes me think I would like, at some stage, to actually edit an anthology myself at some time in the future. I got a great kick out of interacting with all the writers and had a ball at Bristolcon where the book was launched. But then I was talking to John Kenny, editor of Box of Delights (Aeon Press, Dublin, 2011) who told me he had to read over four hundred submissions in order to select sixteen stories for inclusion. So I may be rethinking my previous thought already – being a lazy ba***rd. 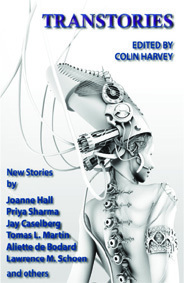 This entry was posted in Writing News and tagged Aeon Press, BOx of Delights, Bristolcon, Colin Harvey, John Kenny, Transtories. Bookmark the permalink.